Flow and Kanban What do we mean by “flow” when we are talking about the management of work? What is kanban and what does it have to do with the management of flow? Organizational culture The way in which a team manages the flow of its work depends heavily on the culture of the organization in which that team exists. What cultural aspects and values are part of the kanban approach to doing work? The Origins of Kanban What are the roots of kanban and how has it developed to become a method applicable to knowledge work? Knowledge work vs. manufacturing How is knowledge work different from manufacturing and why is this important for the management of knowledge work flow? Kanban practices What are the basic practices of Kanban? Value streams What are they? Who defines them? How are they defined? Kanban board basics What is a kanban board? What is its purpose and its basic structure? WIP limits Why it is important to limit WIP, how the limits are allocated and how they are shown on a kanban board. Pulling work and the kanban board The concept of pulling work, as opposed to pushing work, and how the pulling of work is shown on a kanban board. Variability in work What are the types of variability in knowledge work that influence flow? What are the main strategies for managing that variability? Bottlenecks What is a bottleneck? How do we identify them on kanban boards? What are the strategies for managing them? Commitment to delivering work When should a team commit to delivering a result? What are the factors influencing commitment? How does positioning commitment influence flow? Replenishing the input queue What do we mean by replenishment? How is the input queue related to customer backlogs? What are the approaches to replenishment? How does good replenishment help build a sound customer-supplier relationship? Prioritizing work How do we decide what to do next? What are classes of work and how do they influence work prioritization? What is the effect of classes of work on WIP limits? Kanban card structure What are the various attributes of a kanban card? What sort of information is stored on a kanban card? Daily stand-up meetings What is the purpose of a daily stand-up meeting? What is the typical meeting agenda? How does the meeting relate to other activities of the team? 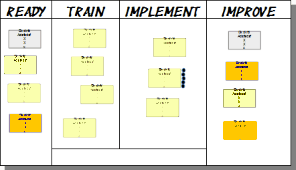 Kanban board swim lanes What are swim lanes on a kanban board and why would we use them? What is the impact of using swim lanes on WIP limits? Flow metrics How do we measure flow? What are the important metrics? How are flow measurements reported? Reporting procedures and tools How and when are kanban reports created? Which tools can help create those reports? Probabilistic management How can we use the principles of flow and flow metrics to manage work in a probabilistic way? What is Little’s Law and how does it help us manage work? What is the impact of a probabilistic approach on the customer-supplier relationship? Implementing the kanban approach What principles are applied in designing a kanban approach? What are the basic implementation steps? Optimization I – batch size What are transaction and coordination costs? How do we use these concepts to tune batch size? Optimization II – WIP limits, value streams and buffers How are WIP limits, the value stream and buffers tuned or managed to optimize the flow of work? Optimization III – other forms of waste What are other forms of waste that impact flow? Operations Review What is the purpose of the operations review? Who attends the review? What is its agenda? How do you prepare for the review and what happens following the review? Kanban maturity model How is the maturity model used? What are the main axes of the maturity model?